The Amazon Web Services EC2 appliance (AMI) is a 64-bit based appliance that is based on Ubuntu LTS (Long Term Support) you can quickly launch on your Amazon EC2/VPC in order to quickly setup your VPN server on the web. To make it more convenient for you to deploy your server in the region closest to you, we currently offer the AMI in all of Amazon’s publicly available regions. If you are looking for the specific AMI ID for one of our images on Amazon AWS for automation purposes, you can find it by going to the AWS Marketplace and going through the launch options until you reach the point where you have to select a region to launch the instance. The appropriate AMI ID will then be displayed to you and you can cancel the launch process then. The BYOL (Bring Your Own License) licensing model is one that relies on your purchasing a software license key separately from our openvpn.net website and activating it on your Access Server installation. This locks the key to the current hardware/software configuration on the instance in question. Making changes to the instance like imaging and relaunching it, or changing the instance type, or enabling auto-scaling, will result in the license key becoming invalid, requiring you to contact us for support on this. See our troubleshooting page regarding BYOL type license keys for more information on how to request a license key reissue or check the licensing state of your BYOL type key. If you expect to have to change instance virtual hardware type or use auto-scaling on Amazon then we urge you to use our Amazon AWS tiered instances instead. It’s also important to note here that when you launch the BYOL type AMI with the instructions given below, then you do not actually need to provide a license key. If you do not provide a license key, the Access Server goes into a type of demonstration mode where all functions are available without time limit, but only 2 simultaneous VPN connections can be made at a time. To unlock more connections, you need to purchase and activate a license key on your Access Server installation. Another licensing model we have available is the AWS tiered instance licensing model which is also available on Amazon AWS. 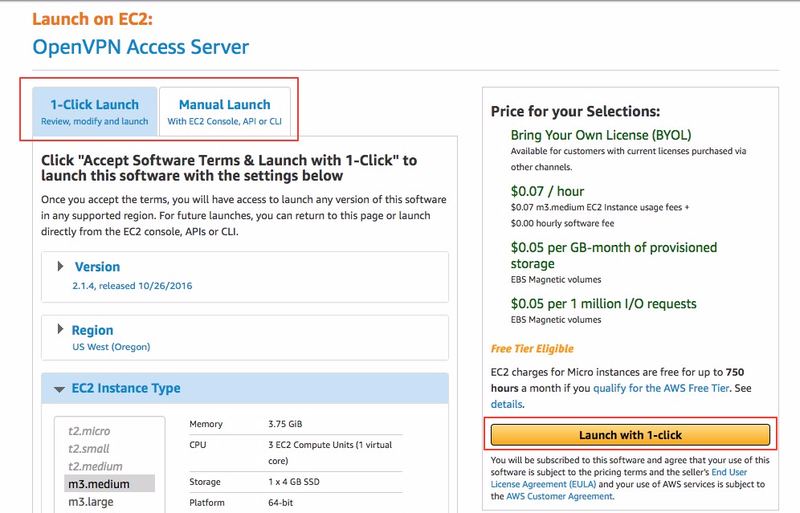 We have a separate guide on how to launch an Amazon AWS EC2 tiered instance. The AWS tiered instance licensing type works without license keys and is licensed through Amazon’s systems and billed through there as well. It can survive changes to instance type and can autoscale. This is a suitable instance type if your IT security policy includes tearing down and rebuilding nodes regularly. To get started, visit the Amazon Marketplace site by clicking here. In the search bar that appears, enter OpenVPN Access Server, and press Enter. At the top of the search results you will see one with no connected devices – this is the BYOL image. Choose this one by clicking on the name. Review the instance information on the page, select the region you would like the instance in and click Continue to launch the instance. This page confirms that you are using the Bring Your Own License image below the region. For a simple launch process, follow the instructions below. Review the instance information on the page, select the region you would like the instance in and click Continue to launch the instance. Version: The default should launch the latest version available on Amazon Marketplace. It’s strongly recommended that you always run the latest version of the software to ensure that security and stability fixes are in place. Region: Select the region you would like to launch your instance in. The default is US East (N. Virginia). EC2 Instance Type: Select the instance type you would like to use for your newly launched instance. The micro or small instances should be appropriate for most small workloads, however, you may want to change the instance type to a higher tier if a higher demand is to be expected. Note that some instance types are not available for use when launching into a EC2 network. Please select a VPC network for all instance type availability. 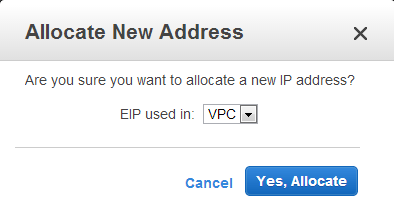 VPC Settings: Select the VPC network or EC2 network you would like to launch the instance in. Security Group: Select the security group you would like to use for this instance. The seller settings contain all of the default ports you would need in order to configure and access your instance. If you are using a custom security group, please ensure that all of the ports are listed properly so access can be granted appropriately. TCP 22 – SSH, used to remotely administrate your appliance. It is recommended that you restrict this port to trusted IP addresses. If you do not want to do this, leave the source as 0.0.0.0/0. To restrict ports to a specific subnet, enter the port number, then the subnet in CIDR notation (e.g. 12.34.56.0/24). For single IP addresses, /32 will need to be appended at the end (e.g. 22.33.44.55/32 for IP address 22.33.44.55). TCP 943 – The port number used by the Admin Web UI. By default, the Admin Web UI is also served on port 443. For security reasons, you can turn this setting off and restrict the Admin Web UI port to trusted IP addresses only. TCP 443 – HTTPS, used by OpenVPN Access Server for the Client Web Server. This is the interface used by your users to log on to the VPN server and retrieve their keying and installation information. It is recommended that you leave this open to the world (i.e. leaving the source as 0.0.0.0/0). The OpenVPN Admin Web UI by default is also enabled on this port, although this can be turned off in the settings. In multi-daemon mode, the OpenVPN TCP daemon shares this port alongside with the Client Web Server, and your clients will initiate TCP based VPN sessions under this port number. UDP 1194 – OpenVPN UDP port, used by your clients to initiate UDP based VPN sessions to the VPN server. This is the preferred way for your clients to communicate and this port should be open to all of your clients. You may change this port number in the settings to a non-standard port in the Admin Web UI if desired. After verifying the instance pricing details, click the Launch with 1-Click button to initiate the launching process. The following dialog should appear. You should then be able to access the instance on the EC2 console. Important: The Access Software link in the software subscription portal will not work until the setup wizard is complete. Please see instructions towards the end of this guide for setup wizard instructions. If the instance was manually launched from the EC2 console with user data information, the setup wizard will be automatically complete upon instance instantiation. To confirm that the instance has successfully launched, watch the Instances section for status. You should see the newly created instance with the same security group and AMI ID you have selected previously. Although not strictly necessary, you should allocate a static IP address for your appliance so the IP address can be reclaimed in case of machine failure/shutdown/reboot. 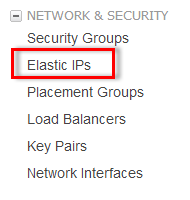 To do so, visit the Elastic IPs section in the left navigation panel. Click the Allocate New Address button. Select the IP address type you would like to allocate. This should match the type of instance you have launched previously. Afterward, click the Yes, Allocate button. Right click the IP address that was created, and then click Associate Address. Select the instance ID this IP address should be associated to. The instance ID can be found in the Instances section, and right next to the instance name. In our case, our instance name is i-99a04ffe. Once your new AMI is successfully launched, you will need to SSH into the console using a SSH client software and the private key pair you have used/created previously. In this section, we will cover the most common case for users using the Windows operating system, and the PuTTY SSH client. If you have a different configuration, please follow Amazon’s specific instructions on how to connect to your instance. Launch the PuTTYgen tool. click Conversions -> Import Key. Select the key file you have previously used or generated, and click Open. The PuTTYgen tool will no longer be needed at this point. To continue, open the PuTTY client you have downloaded earlier. In the Host name (or IP address) section, enter the static IP address you have allocated previously. In our case, this is 23.21.108.51. Then, on the left navigation panel, navigate to SSH->Auth. Under the Private key file for authentication: section, click Browse… and select the private key file that PuTTYgen has generated in the previous step. To connect to the server, simply click the Open button. However, to simplify the process in the future, you may want to save these settings as a profile. To do so, return to the Session category on the top, select a name for your session under the Saved Sessions box, and then click the Save button. The settings then can be loaded back by double clicking the profile, or by selecting the profile, and then clicking the Load button. 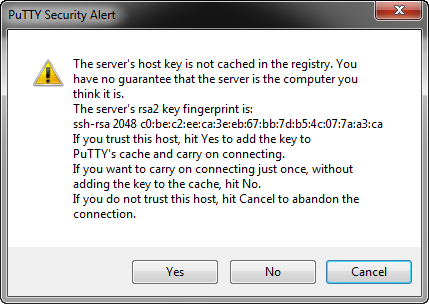 Upon connecting, you will receive a warning that PuTTY has not seen this server before. It is safe to simply click Yes on this dialog. If the private key you have specified was correct, you should now be logged in and the OpenVPN Access Server Setup Wizard should now be started. Follow the instructions below to begin configuring your server. The OpenVPN Access Server Setup Wizard runs automatically upon your initial login to the appliance. If you would like to run this wizard again in the future, issue the sudo ovpn-init –ec2 command in the terminal. Read through the EULA, and enter yes to indicate your agreement. > Will this be the primary Access Server node? > Please specify the port number for the Admin Web UI. > Should client traffic be routed by default through the VPN? Explanation: If you only have a small network you would like your remote users to connect to over the VPN, select no. Otherwise, if you would like everything to go through the VPN while the user is connected (especially useful if you want to secure data communications over an insecure link), select yes for this option. > Should client DNS traffic be routed by default through the VPN? Explanation: If you would like your VPN clients to able to resolve local domain names using an on-site DNS server, select yes for this option. Otherwise, select no. Do note that if you selected yes for the previous option, all traffic will be routed over the VPN regardless what you set for this option here. > Use local authentication via internal DB? > Should private subnets be accessible to clients by default? Explanation: This option defines the default security setting of your OpenVPN Access Server. When Should client traffic be routed by default through the VPN? is set to no, it defines the list of subnets that your VPN clients are able to access. You are able to add more entries to this list once you login to the Admin Web UI area. This option will have no effect if Should client traffic be routed by default through the VPN? is set to yes. > Do you wish to login to the Admin UI as “openvpn"? Explanation: This defines the initial username in which you would use to login to the Access Server Admin UI area. This username will also serve as your “lockout" administrator username shall you ever lock yourself out of your own server. If you would like to specify your own username, select no. Otherwise, accept yes for the default. 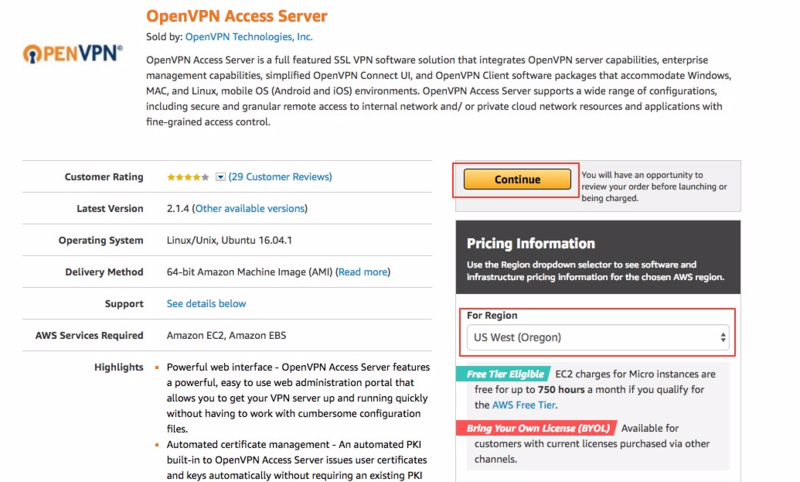 Explanation: If you have purchased a license key for your OpenVPN Access Server software, enter it here. Otherwise, leave it blank. OpenVPN Access Server includes two free licenses for testing purposes. After you complete the setup wizard, you can access the Admin Web UI area to configure other aspects of your VPN. Please note that as Amazon does not reveal the elastic/external IP inside the machine, the links displayed within the setup wizard will not work in accessing the web interfaces. For this reason, you will need to replace the internal IP address with the external IP that Amazon has given you. As mentioned previously, you will be able to access the Admin Web UI on both the VPN port and the Admin port unless you disable this behavior in the Admin Web UI. If you did not assign an elastic IP prior to launching the instance, or you have a custom hostname you would like to use, you will need to login to the Web Admin UI and configure the Hostname parameter manually (inside the Server Settings section). You may either use an IP address or a hostname here, although it is strongly recommended that you use a hostname since your clients will depend on this setting to be able to know where to connect to, and updating a DNS record is much easier than reinstalling all clients to update the IP address they need to connect to. Also, SSL certificates require a proper FQDN hostname in order to function properly. Note: If you leave this setting as the default, NONE of your clients will be able to connect to your VPN server since by default it is set to a non-routable (private) IP address! If your VPN setup consists of a site-to-site setup between your cloud instances and your machines on-premises, you will need to disable source destination check protection on Amazon, otherwise routing will not function properly. To do this, right click on the VPN instance, select Change Source/Dest. Check and make sure the status is Disabled. This setting must also be used if for for example want traffic from your VPC to go directly to the IP addresses of your VPN clients in the VPN client subnet or this security feature will block the traffic.